Focal (or targeted) therapy is an emerging new treatment option for appropriate patients with cancer confined to only a zone or region of the prostate gland. The goal of focal therapy is to achieve long-term cancer control without the side effects of a total gland treatment. Our advanced diagnostic[link to Advanced Diagnosis] pathway with MRI guided fusion mapping biopsy can determine whether the cancer is widespread throughout the prostate (multifocal) or confined to only a small part of the prostate (focal). 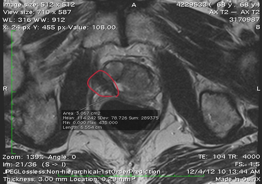 The prostate can be treated partially or focally by MRI Fusion Guided HIFU, cryotherapy or laser technology. Ahmed and Emberton out of the UK, using HIFU, have demonstrated excellent results. Focal HIFU is effective over 90% of the time and preserves both sexual and urinary function. 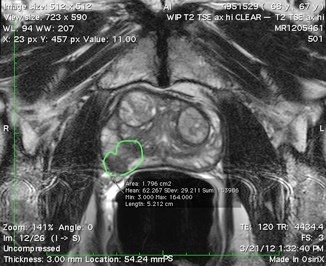 The Scionti Prostate Center has the largest MRI Fusion Guided Focal HIFU experience in the United States. 5 years after Focal HIFU, the patient is cancer free as determined by Artemis MRI guided fusion biopsy. The area in red represents scar tissue completely replacing the tumor. This man has completely normal sexual and urinary function. First, there must be confirmation that a patient’s prostate cancer is suitable for targeted treatment based on a comprehensive and intensive diagnostic protocol. Next, the procedure must be performed by a physician with proven skills and broad experience in the interpretation of MRI and in using different treatment technologies for focal therapy. Finally, the patient must be fully aware of the risks and benefits of a focal treatment and be willing to comply with a well-designed treatment follow up plan. To find out if you are a candidate for Focal Prostate Cancer Therapy, click here. Over the past 15 years Dr. Stephen Scionti has developed the largest and most experienced practice in the field of targeted (or focal) prostate cancer therapy. Today, he is recognized around the world for his experience and skill in the field of image guided prostate thermal ablation. Dr. Scionti has gained international recognition for his work in advanced prostate cancer diagnostics and minimally invasive prostate cancer therapy, specifically guided thermal ablation technologies. Dr. Scionti is currently Founder and Director at the Scionti Prostate Center in Sarasota, FL. and Medical Director of Vituro Health. Dr. Scionti formerly served as Clinical Associate Professor of Urology and Director of Prostate Cancer Ablation Surgery at the Joel E. Smilow Comprehensive Prostate Cancer located at the New York University School of Medicine and Langone Medical Center. To inquire about your candidacy for Focal treatment of your prostate cancer , request an evaluation by clicking here.